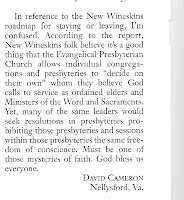 An interesting letter to the editor by David Cameron appeared last week in the Presbyterian Outlook regarding the New Wineskin Association of Churches. The writer asked why this group of churches would consider leaving the PC(USA) denomination due to the possibility that the Authoratitive Interpretation may lead to local option, because the EPC–the denomination which the NWAC would possibly join–is already employing local option. While it is an interesting question, I think the answer is the same as the systemic problem of our current polity within the PC(USA): Trust. The NWAC and likeminded PC(USA) churches would feel safe and secure within the EPC theologically and with regard to scriptural authority, therefore they would be able to trust other church’s within the new denomination to uphold the standards they, themselves, adamently believe in. Likewise, the reason that the AI will not work within the current state of the PC(USA) is due to the lack of trust from one CPM to another. If we believed that the Holy Spirit was still actively guiding and leading all of our Committee’s on the Preparation of MInistry to adequately admonish, encourage and challenge candidates for ministry (not to mention sessions with regard to elders), then local option would not be problem. However, as most candidates can attest, the current process with CPM is rarely anything other than a beaurcratic hoop. Beyond the one point of contact (the liasion), the committee’s rarely are involved in the supporting and encouraging of the candidate, are not familiar with his/her Christian practices (worship, prayer, etc.) and generally not familiar with the person beyond a once a year interview. This prevents the CPM from providing admonishment and discipline in the call process. Personally, I believe this issue of denominational (dis)trust begins with a candidate’s interactions with the Presbytery through the CPM, which no longer seems to provide a safe, supportive and trustworthy environment, but merely an obsticle to get through. EPC = Evangelical Presbyterian Church? I had a great experience in an EPC congregation outside Wheaton, IL – but I get the feeling (from subsequent experience) that there can be significant difference between congregations in that denomination. Important point on Local Option in the EPC. The issue is completely different. In the EPC it’s ordination of Women, in PCUSA it’s ordination of those practicing sexuality outside the bounds of Christian Marriage. I think it’s important to differentiate the two. I’m thinking that ordination of women isn’t acceptible to be a Local Option. That makes the EPC’s position & joining them, untennable. I think in light of this, the letter is more appropriate. That actually parallels well my conversation this week in Biblical Theology and the Practice of ministryIs women’s ordination adiaphora or an issue of justice? Clearly within the PC(USA) it is a distinguishing mark of our denomination, but are we called to transform the perspectives of other denominations to do likewise?Or is it adiaphora which allows the PC(USA) to provide a unique calling for people and ministries. If it is adiaphora, then that would permit local option.However, when we look at the numbers, currently the EPC has smoething like 2 ordained female ministers. If these 108 PC(USA) churches were to join the denomination, it would bring 40 women into their denomination. So if women’s ordination is an interest of justice and transforming the perspective of other denominations, this may be an avenue to do just that, which would make it more “tenable.”Also, let’s not kid ourselves into thinking the PC(USA) is good at calling and confirming women into the ministry of W&S, I will check <>God’s Potters<> but I believe the number is about 18%, and i think in total less then 20 women are head of staffs.